Key regulations passed by the New York City Council on Uber and Lyft are a result of years of organizing by the taxi drivers' union. For the union, which brought both ride hail and traditional drivers together in support of capping the number of ride-hailing vehicles, this decision marks a stunning reversal in political terms. Three years ago Uber bested attempts at regulation. The company had friends in high places, including Gov. Andrew Cuomo, and over the years remained unchecked as it rolled out more and more cars. This has contributed to a scenario in which traditional cabs are now outnumbered by app-based cars. The glut of new vehicles decreased the number of available fares for each driver, contributing to a major reductions in income. This helped create dire working conditions. Over the course of six months, six professional drivers committed suicide, some of whom directly cited changes in the industry as motivation. Sixty-one-year-old driver Douglas Schifter, who penned a manifesto against the current state of the industry before shooting himself in front of City Hall, claimed to have been working 120 hours a week. Schifter named Uber, Gov. Cuomo and former Mayor Michael Bloomberg as complicit in creating the harsh conditions pushing him to end his life. He was soon joined by Nichanor Ochisor, who also found his livelihood compromised by ride-hailing apps, and Kenny Chow, who threw himself into the East River to escape mounting debt. Fifty-nine-year-old Yemeni immigrant Abdul Saleh became the sixth driver to commit suicide in June. All of Saleh’s earnings had gone into leasing his car. Richard Chow, a driver of 13 years and owner of a taxi medallion, lauded the measures and spoke to some of the hardships he experienced after being forced to compete with Uber. Chow criticized Uber and other ride-hailing services’ exemption from purchasing medallions, which essentially function as permits for yellow cabs. Medallions were once valued at $1.3 million, but then sank to $300,000, making them financially burdensome for owners like Nichanor Ochisor and Kenny and Richard Chow. Uber and Lyft’s success is intrinsically tied to this collapse. Richard Chow said he is $400,000 in debt on his medallion while his brother owed $700,000 before ending his life. After these tragedies, however, these new laws could herald a change in drivers’ political fortunes. “Today means that there’s a new day for us. It’s a reminder that worker organizing can beat corporate lobbying when we come together,” Desai said. The role of the Taxi Workers Alliance in bringing City Council to this point was pivotal. Desai explained that while the NYTWA is a comparatively small union that does not have a great deal of formal lobbying infrastructure, it has managed to garner a considerable amount of influence. Desai noted that the recent legislation was directly responsive to the union’s policy platform. 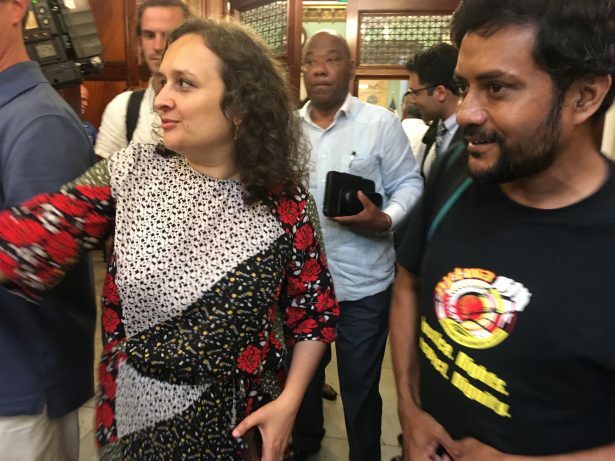 “This was a grassroots organizing win,” she said, pointing to the over 20 actions in front of City Hall undertaken to compel the council’s response to the both the taxi worker suicides and brutal working conditions. Desai also mentioned that throughout this fight the union has put together a mental health program for drivers in addition to providing both bankruptcy and eviction services. Desai commented on the wider significance of this victory, saying that New York’s approach to regulation is probably the “most comprehensive.” Moreover, she noted that New York is “Uber’s biggest market” in the United States and thus subject to tremendous investment and lobbying from the company. Desai hopes that New York’s position will be a trailblazer for other cities looking to regulate ride-hailing services. Desai and the rest of the union know, however, that the city’s reversal was the beginning of another struggle. The legislation that just passed must now be implemented, so workers have to wait for the beneficial effects to kick in. Moreover, later that day City Council introduced six additional pieces of legislation that, if approved, would incorporate even more of the Taxi Workers Alliance’s platform into law. Among these are the establishment of a health benefits fund for drivers and requirements that the Taxi and Limousine Commission find ways of relieving indebted medallion owners. The commission would also be obligated to provide centers for mental and financial counseling in addition to establishing an Office of Inclusion focused on “promoting diversity, inclusion, and cultural sensitivity in the industry, especially as they relate to service refusals.” This last measure is presumably meant to address complaints from black and Latinx New Yorkers who experience discrimination by cabbies. Skanda Kadirgamar is a writer based in New York City who follows anti-war and anti-racist activism. Skanda's writing has appeared in The Nation and Truthout.